As marketers, we know that the shift to digital is nothing new. For years there has been a steady march from print media — brochures, newsletters, and direct mail pieces — to online assets like emails, eBooks, and blog posts. According to ENGINEERING.com’s annual survey of engineering marketers’ plans for the 2017 calendar year, the fruits of our digital content labors have been confirmed. Though the complete transition to digital still has a ways to go, it’s certainly being reflected in marketing budgets more and more. 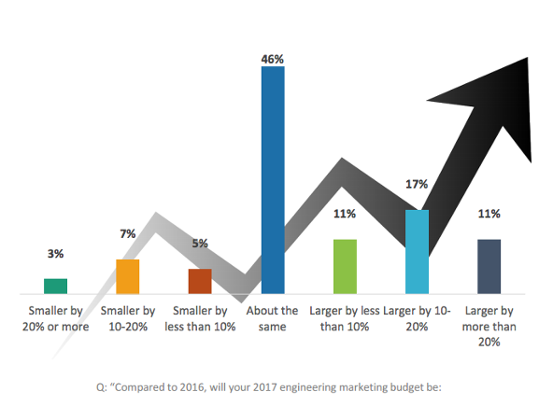 The survey, comprised of 85 engineering marketers across a range of industries (primarily manufacturing and design software), resoundingly showed that marketing budgets are on the upswing. Twice as many respondents reported growing budgets than shrinking budgets, with software marketers landing the top spot at 41%. The vast majority of these budgets? Content. When segmenting marketers out into Top Performers, Industry Average, and Laggards, the survey found that Digital Enthusiasts (those investing more than 70% of their budget into digital marketing efforts) comprised the bulk of Top Performers at 41%. Conversely, Digital Skeptics (those investing less than 30% and far outspending other groups on print and offline activities) were least likely to be Top Performers at 25%. So, what exactly is it they’re investing in? Let’s take a look at some of the details of the findings and where this money is going. As ENGINEERING.com President John Hayes noted in the report, the number of marketers maintaining trade show budgets has declined, with more funds being allocated toward content creation. Over time, this has actually created a surplus of low-quality content. Despite the overflow, however, it’s more important than ever to continue investing in content creation and distribution to ensure you’re producing unique, high-quality content that will cut through cluttered inboxes and stand out from the competition. 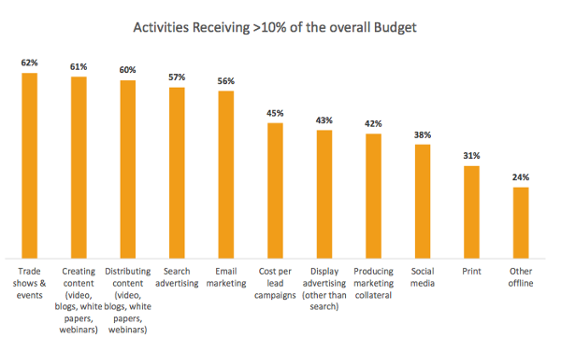 Among Top Performers dedicating less than 10% of their budgets to a specific marketing activity, content creation took the cake, closely followed by content distribution; 72% of this group have prioritized these activities above all other marketing efforts and, of the top five investment areas reported for 2017 overall, four of them — video, webinars, case studies, and blogging — were content marketing strategies. Of that top five investment area list we just mentioned, video landed the top spot of strategies to try in 2017. In fact, 37% of all respondents reported ramping up their video budgets this year. 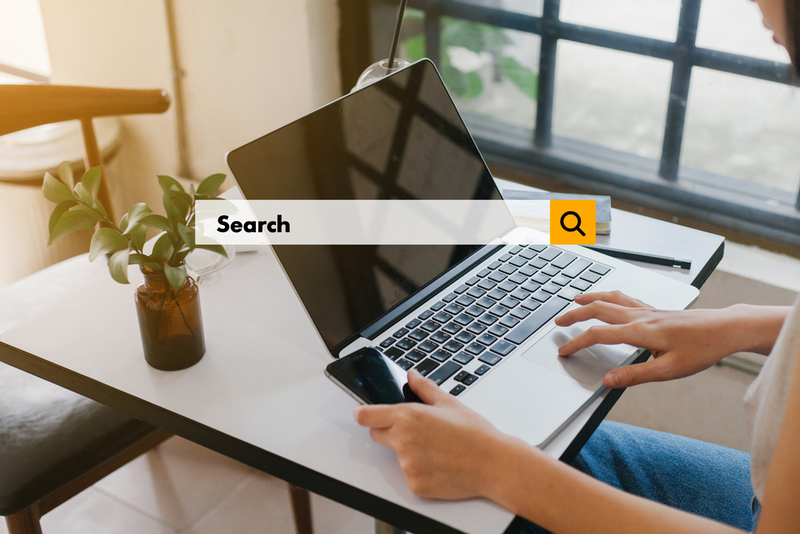 While traditional long form content such as eBooks and case studies are still valuable offers, consumers are looking for a more balanced content diet. 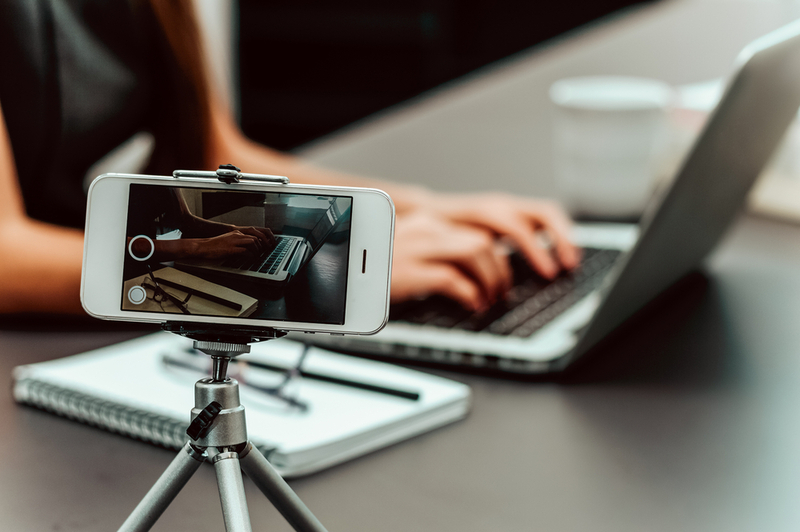 You can add diversity to your offerings by including videos touring your facility, demonstrating products in their working environments, breaking down complex processes with whiteboard drawings, and showcasing customer testimonials. Even short clips will give users a more holistic view of who you are as a company and why they should trust you with their business. Email budgets remain mostly stable from last year but make no mistake – it can be a highly effective marketing tool, especially as a form of content delivery. Overall, email ranks in the top five investment areas, with 56% of survey respondents allocating more than 10% of their overall budget toward it — among top performers, this number jumps to 68%, likely because they see the distribution value. This past year, many customers requested email marketing campaigns as a way to capture new prospects for their content marketing workflows. While few marketers have unlocked the secret to using mobile in the industrial marketing space, the opportunity is huge. Think of how often you use your mobile phone to look up information. Your prospects are doing the same thing. A 2016 report from ENGINEERING.com found that half of all engineers were accessing engineering information from their phones — and the percentage is even greater among younger engineers. 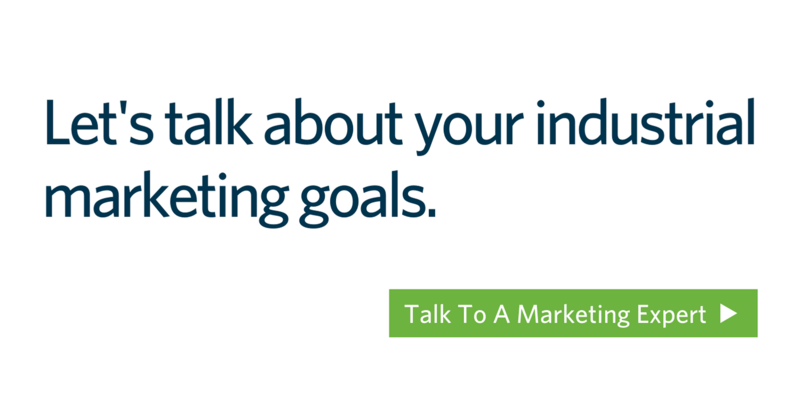 Interested in ramping up your marketing efforts this year? We have a number of free resources to help you get started on any one of the strategies mentioned above, and many more. As always, feel free to browse the blog for more ideas or reach out with any questions.